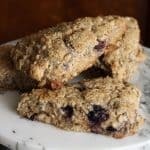 Blueberry Ginger Spelt Scones, a favorite with tea or coffee, gets a makeover with creamy yogurt, nutty whole-grains, juicy blueberries and spicy ginger. Start: Heat oven to 350° F. Spread sunflower seeds on baking sheet. Bake in oven for 7-10 minutes, until fragrant, but not browned. Set aside to cool. Increase oven temperature to 425° F. Line a cookie sheet with a non-stick baking mat, parchment paper or spray it lightly with cooking spray. Mix: In a large bowl, stir together flour, sugar, wheat germ, baking powder, salt, and sunflower seeds. Add butter and blend with a fork or pastry blender (or pulse in a food processor) until the butter is about the size of peas. In a separate small bowl, mix yogurt, egg and vanilla until well blended. Pour the yogurt mixture, blueberries and crystallized ginger into the buttery flour. Stir gently with a fork, just until the mixture comes together in a ball. Scrape the dough onto a lightly floured surface. Bake: Pat into a disc that’s about an inch thick. Slice the dough into wedges. Set the scones a couple inches apart on the baking sheet. Brush each scone with milk then sprinkle raw sugar over top. Bake scones for 20-25 minutes. The tops should be golden brown and a toothpick inserted in the center of one comes out clean with no wet batter. Cool on a wire rack.